15 Expenses Labels. You get half a sheet of labels. 1 label for each month along with 1-Recruit Leads, 1-Booking Leads, 1-Call ASAP. 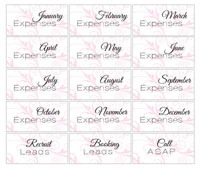 Great for keeping track of your monthly expenses. Put them on any type of folders or forms that you use.